There comes a moment in every guitarist's life when your improvisations seem to all sound the same. You find yourself using the same old licks over and over, then you learn a few new ones, and then even the new ones start to sound like the old ones! So maybe you go and learn a new scale (or a dozen new scales). And while they sound different - after all, you are using different notes and intervals now - somehow the music still sounds the same. What's happening? This is not a fun place to be at all, and I have seen a few players giving up the guitar because of the frustration. After all, when you improvise you want to generate new music constantly... and if you are not able to do it, what does this tell you about your creativity? What I have found is that most guitar players focus too much on learning new scales, arpeggios, etc... but they neglect to work on other important aspect of improvisation... and so they get stuck in a few 'playing patterns' that surface over and over in their music. And the crazy thing is that if you are stuck in these patterns, you do not realize that they even exist. In fact, if you noticed them, then you would be able to break them immediately. So what can you do? In the following video I am working with a student to help him getting out of his usual patterns of improvisation. I give him a few simple exercises and we work on them together, and by the end of the lesson you can hear how his improvisation got better. If you followed this video with the guitar in your hand and did the exercises in it, then you should be able to hear and feel a difference already in your improvisation. As you can see, a very little practice goes a long way if you know exactly what to practice. 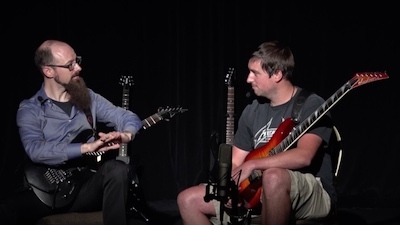 And if you like the sound of it and want to know more about how to solo, check out this course on scales and modes on guitar so you can learn what works on each chord and chord progression and develop your own style.